Spread the dressing on a slice of the bread. On the other slice, place all of the meats, then onions and peppers and top with cheese. Lay the dressed bread atop the other meats. 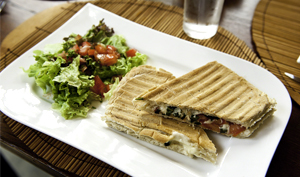 Brush the olive oil on top of both sides of the sandwich and grill on thePanini Grill for approximately 4 minutes. Final cooking temperature must reach at least 140° F for 15 seconds.